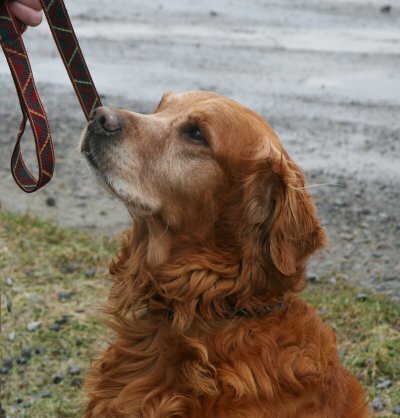 Hilfy is the foundation of our breeding program. She continued to rule the roost here at Fern Hill until her death at 13 years, 8 months in January 2016. 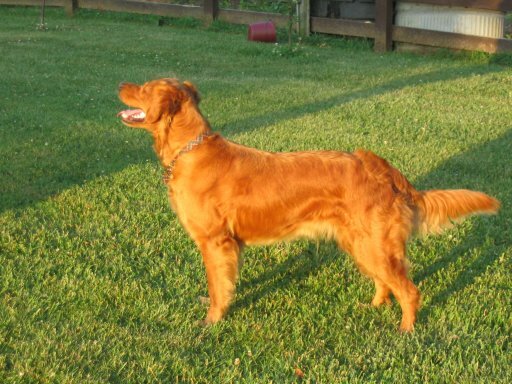 The accomplishments of her puppies qualified her for the Golden Retriever Club of America's Outstanding Dam title. She joined her parents and all four grandparents who also earned GRCA outstanding producer titles. 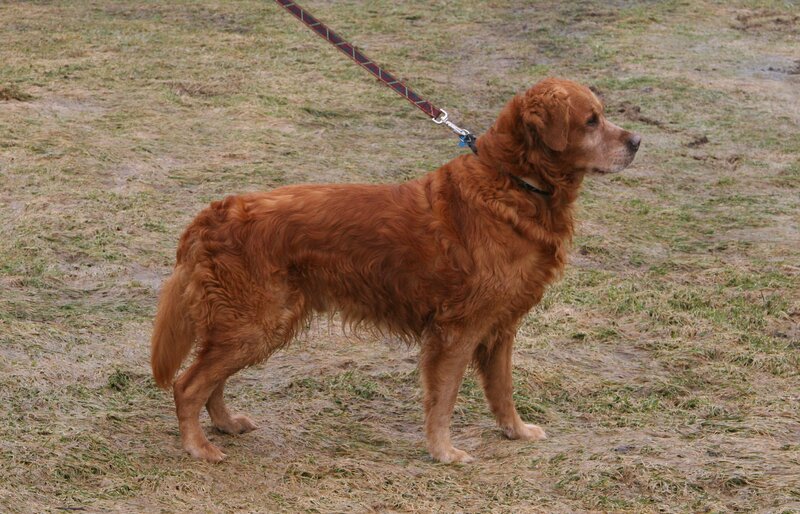 Thanks to breeders Carol Lantiegne and Joan and Ken Kogut for this beautiful, brilliant, bouncy golden! 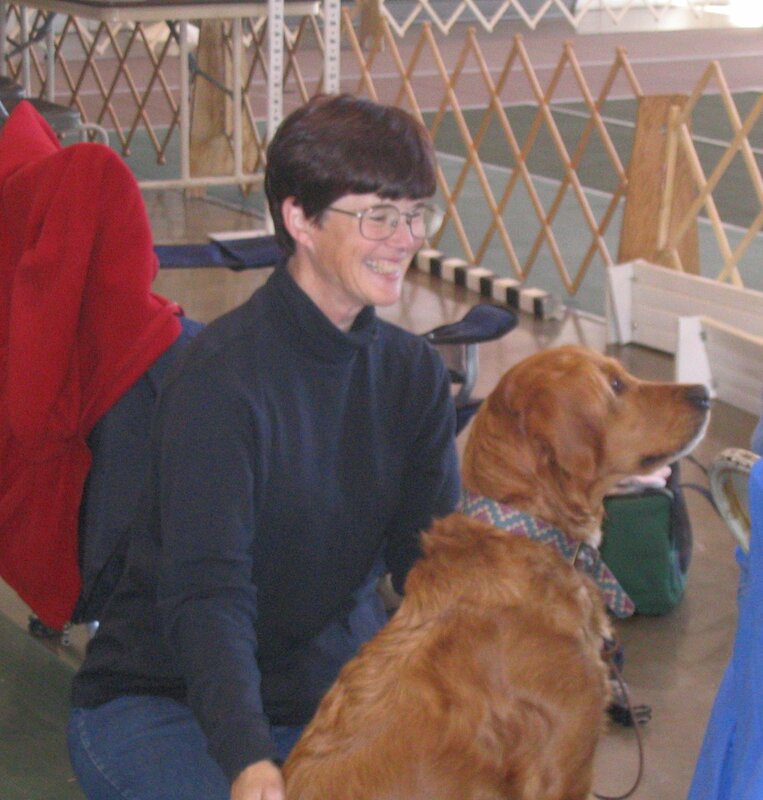 She was a wonderful companion, a superb mother, a great working farm dog, and a stylish worker in the obedience ring. She had loads of talent for field work as you would expect from her heritage, but we only did the most basic work with her in that area. She was a superb mouser in the barn, and earned the nickname Hilfy Molemaster for her ability to sniff the blighters out in their tunnels, dig them out and finish them off. 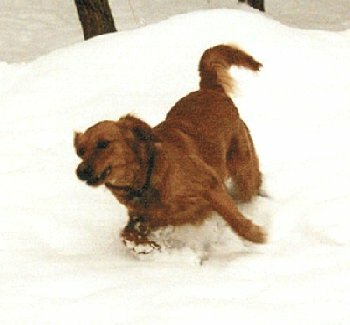 In her younger days, she could catch rabbits and squirrels on the run and leap up in the air and catch low-flying birds. 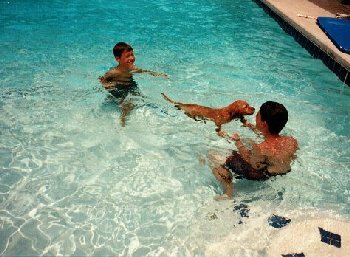 She enjoyed going on walks with me, swimming in our pool in the hot days of summer, and splashing through any puddle that came her way. In the house, she was calm and companionable. 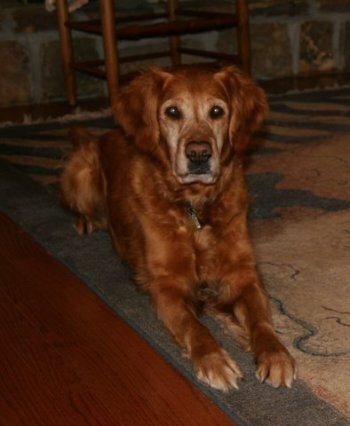 Her favorite indoor activity was watching TV, especially nature shows, dog shows, horse racing, and bull riding. 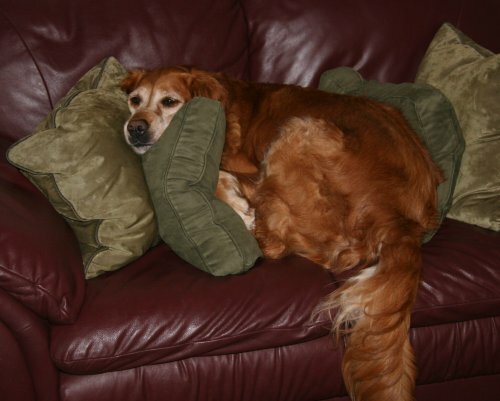 She was distressed that our family doesn't watch TV nearly as often as she would have liked! 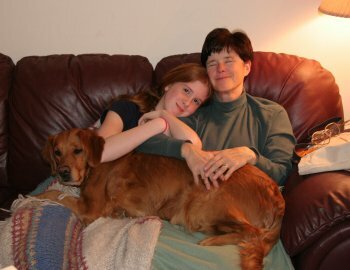 Hilfy's performance career was frequently interrupted by Mommy duties, and once we began actively showing her daughters and granddaughter, she still didn't get the opportunities she deserved. 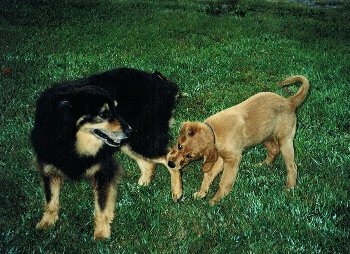 Her 'kids' are active in many venues, from hunting and hunt testing, through obedience, rally, and agility, to search and rescue, tracking, therapy, and police work. They also are wonderful family pets! 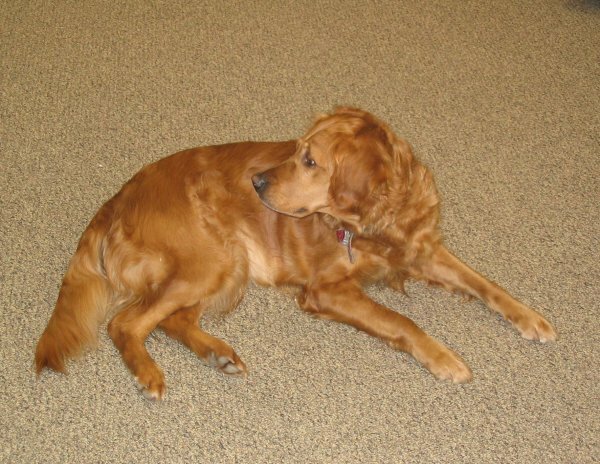 She was the perfect pet and foundation dog -- joyous, a great companion -- think of a good thing to say about a dog and it was true of Hilfy. 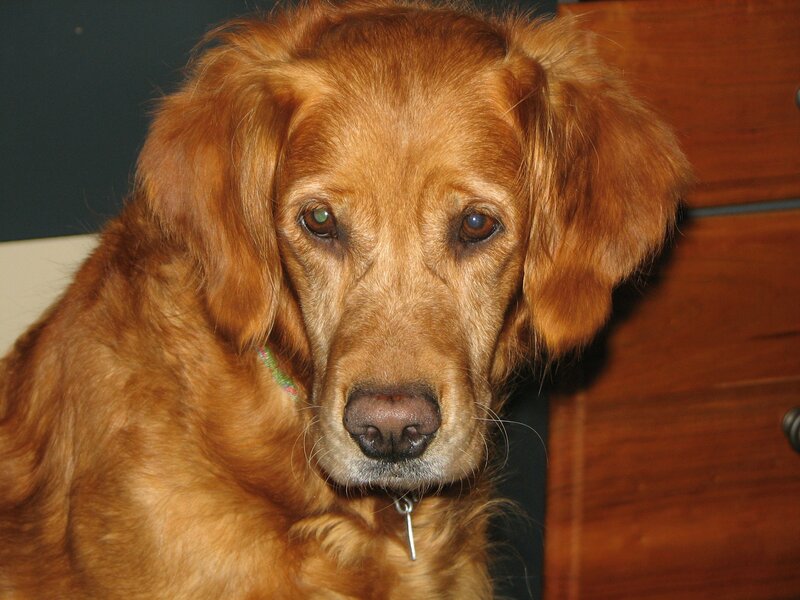 We will always miss her, and are eternally glad to have shared her life and love, and that she has 26 puppies and a number of grand and great-grand puppies to carry on her indomitable spirit. 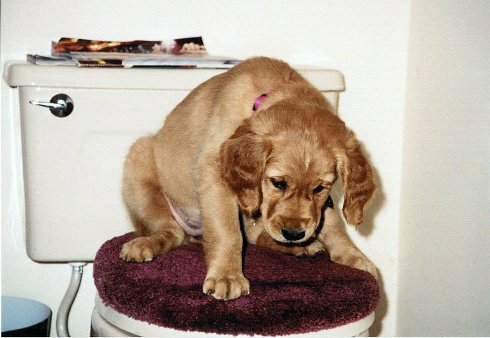 The Golden Retriever Club of America (GRCA) sponsors the Certificate of Conformation Assessment program, which provides for three conformation judges to evaluate presented dogs against the Golden Retriever Standard. If they make a minimum score of 75% under three separate evaluators, they are awarded a Certificate. 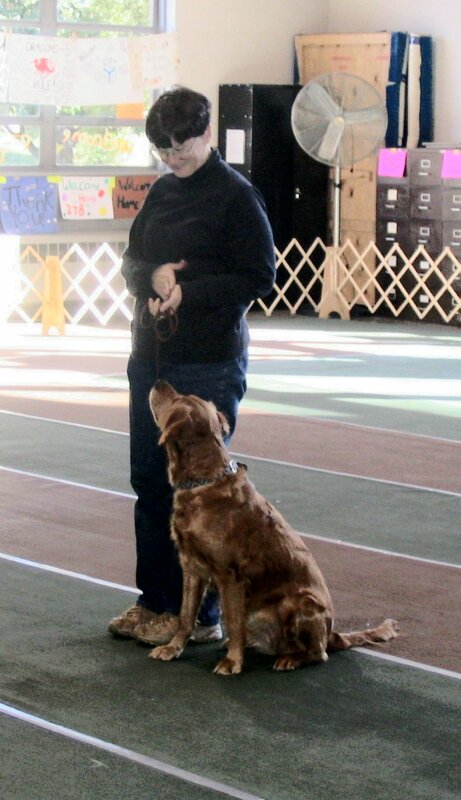 Hilfy was presented for the first time at the GRCA National Specialty on October 27, 2014, and passed by all three evaluators her first time out with flying colors and high scores in all categories from all evaluators. She also received many, many compliments on her outstanding condition and youthful appearance (except for the gray), her wonderful free and correct movement, her beautiful head, and her overall quality conformation. Hilfy loved the attention and getting to be out in the ring again! 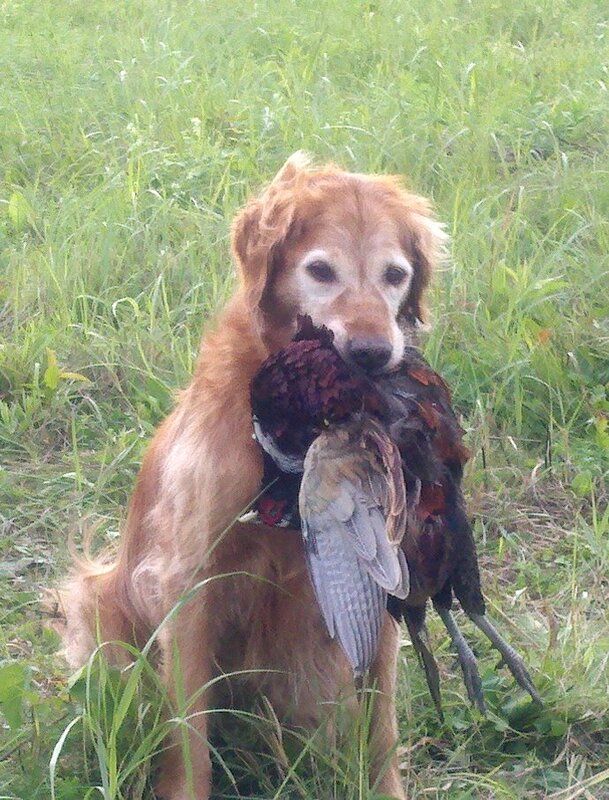 To earn this title, which is awarded by the Golden Retriever Club of America, Hilfy had to have at least three offspring with advanced titles (Senior Hunter, Utility Dog, etc.) totalling at least 32 points. Hilfy's current total is 56 points, and her 5 qualifying progeny are Young's Rusty Speaker of Fernhill MH, Fern Hill Hunter MH, our own Fern Hill SuperCalifragilistic MH WCX CD OAJ OF OA , Fern Hill Sedona Sunrise SH WC CGC CCA, and Fern Hill's Sizzlin' Red Hot MX MXJ CCA. There are several other title winners among Hilfy's sons and daughters who are close to having qualifying titles; some of them may make it in the future but others are retired from competition. A big thanks to the owners for the time and effort (and money!) in competing with their dogs, and a huge hug to each of Hilfy's children! 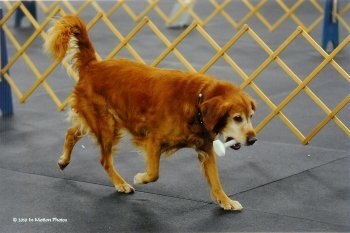 After an almost three year break, Hilfy returned to the obedience ring in 2009 and earned her first Open leg at the Western Carolina show in Waynesville, NC, in her first Open class. 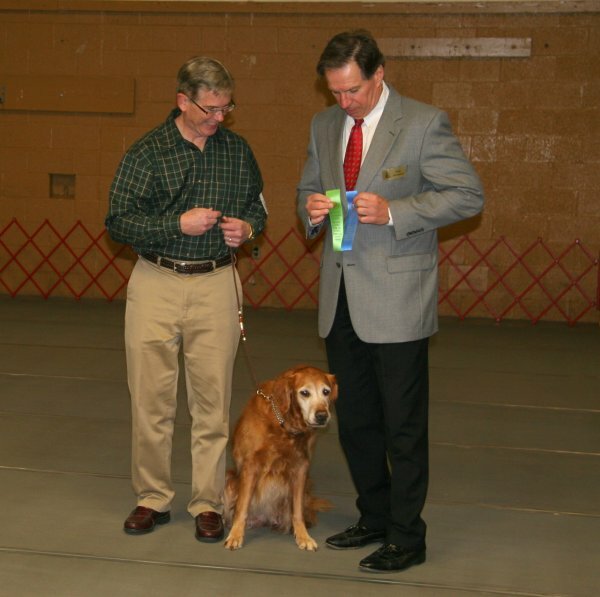 She qualified with a third place ribbon out of a class of 10. She did it in spite of her nervous handler (Karen) who (embarassingly) was single-handedly responsible for losing 6 points through handler errors. 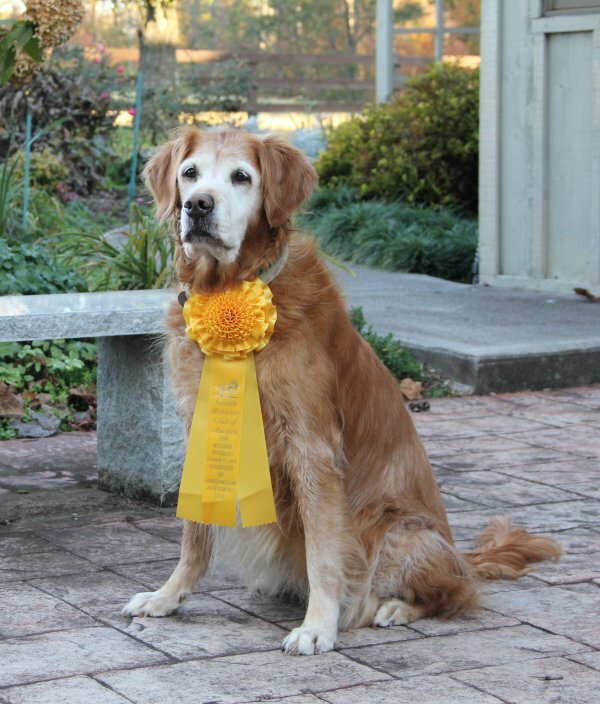 It took another two years before we got her out to finish up -- Jim handled her for her second leg also at Asheville on October 8th, 2011 with a second place ribbon, and earned her title at the Knoxville Cluster Show on November 3, 2011 with a first place finish. 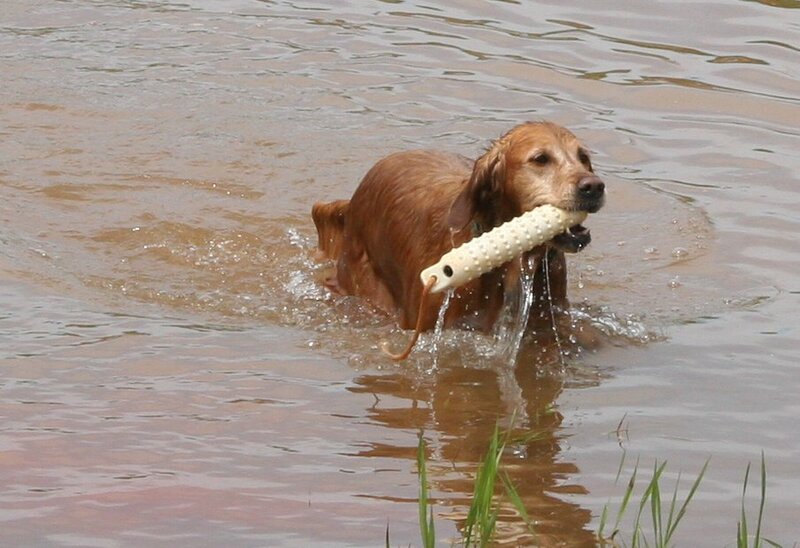 We retired her from the show ring at 9 1/2 -- we think she can just play from now on! 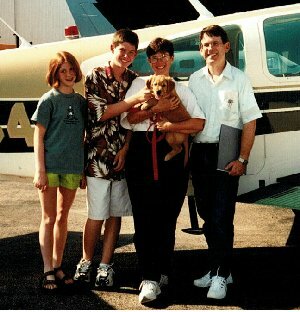 Hilfy passed her TDI test in February 2010 with flying colors. We have not been active in therapy work, unfortunately, as our schedules just haven't permitted adding this to our plates. We hope this will happen sometime in the future, as Hilfy loves meeting new people. HILFY FINISHES HER AKC CD NOVEMBER 4, 2006! 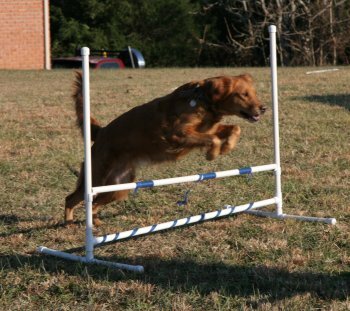 At the Tennessee Vally Kennel Club Obedience Trial, Hilfy qualified for her third leg and placed 1st with a score of 193 1/2 in her Novice A class. She was only 1/2 point behind tying for High Score in Trial. Yay, Hilfy! She earned all her legs with placements of 3rd or better. Hilfy wins her ASCA CD, 3 legs in the minimum 3 shows, with 1st or second place in each leg. 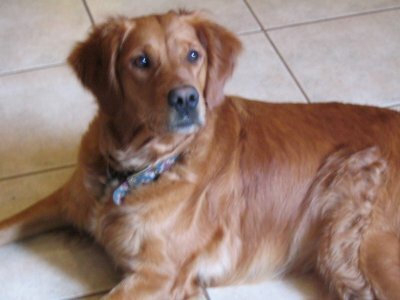 Hilfy had a total of 26 puppies in four litters, and was retired and spayed in February 2009. 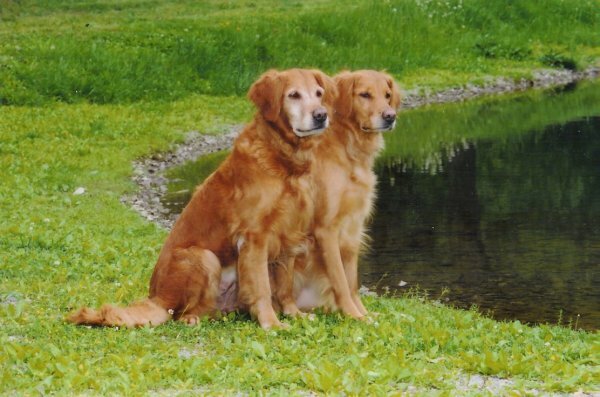 We kept two of her daughters, Penny and Callie to carry on with our breeding program. 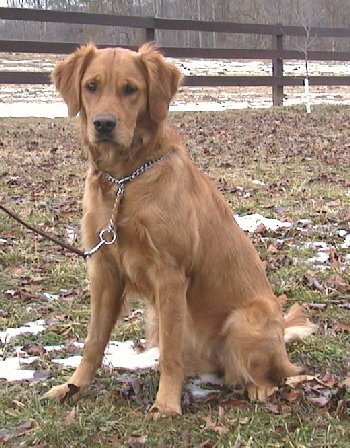 Hilfy's first three litters were sired by the beautiful and ultra-accomplished AFC AFTCH Rosehill's Mr. Speaker MH OS CCA FDHF -- May 28, 2005; August 3, 2006; and March 26, 2007. 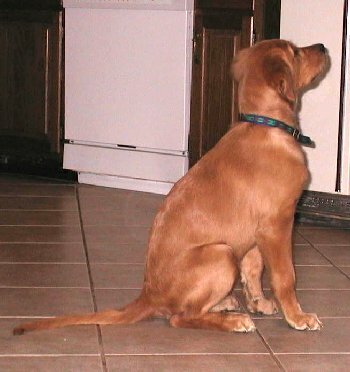 Her June 5, 2008 litter was by Trifectas Repeat Performance *** MH UD CCA WCX VCX OS CGC Can CD ("Ditto"). 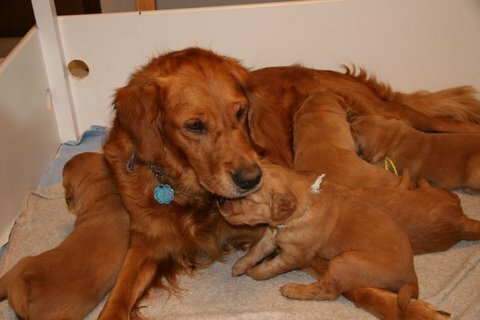 Hily was an outstanding mother, and her puppies that have competed have done very well in many different venues, earning her the Golden Retriever Club of America's prestigious Outstanding Dam title. 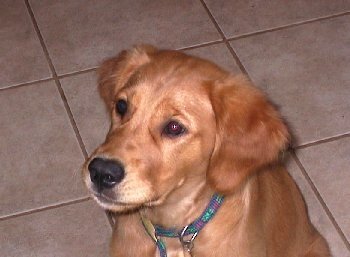 Although Hilfy is through having puppies, if you might be interested in a puppy from one of her descendants, see our Puppy Information page or drop us an email at: edwardskc@pegasustech.com. Working/ competition homes are preferred, but the quality of the home is most important. Hilfy with her CCA ribbon 11/7/14. Other than being grey, she certainly doesn't look like an old dog! 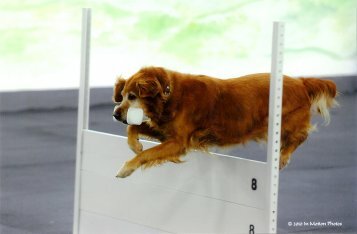 At 8 1/2 years, Hilfy competed in Open Obedience. 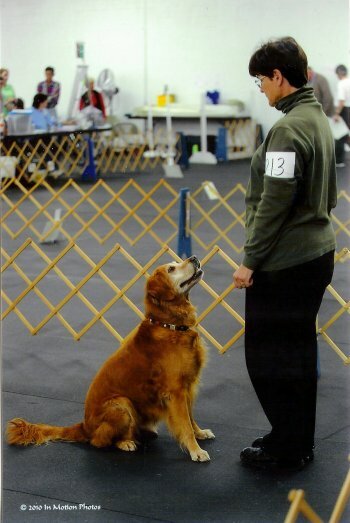 She would have passed at this test, but I disqualified us with an extra command on the last exercise -- I was so excited that I lost my head, so we had to wait a little longer to get our title. 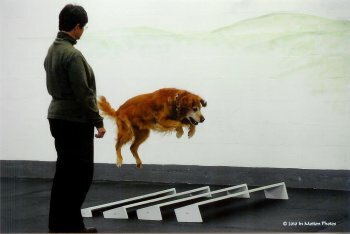 The broad jump picture is typical of the exuberance that she uses on this exercise; the high jump picture is not typical as she usually sails over with room to spare. She didn't hit the jump, but it's hard to see how she missed from this picture. She may have a gray face, but she is still a bouncy and very active dog in her prime. Above, retrieving bumpers at Lorie Jolly's (4/18/09). At right, home but waiting for some action (4/14/09)! Hilfy, 9 weeks pregnant with her March 2007 puppies. Hilfy and her puppy Penny go to work every day with Karen. 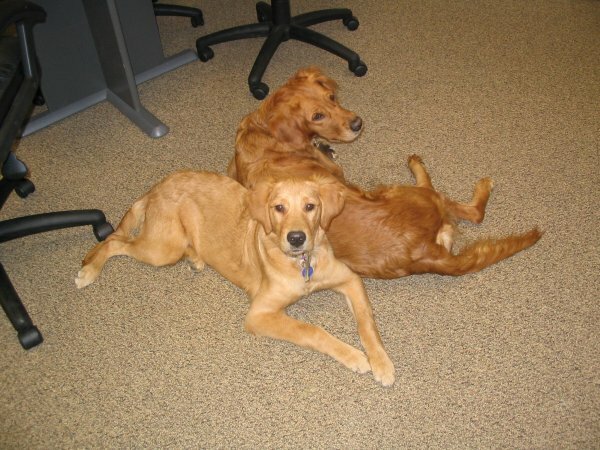 Here are the well-behaved office dogs, November 10, 2005. 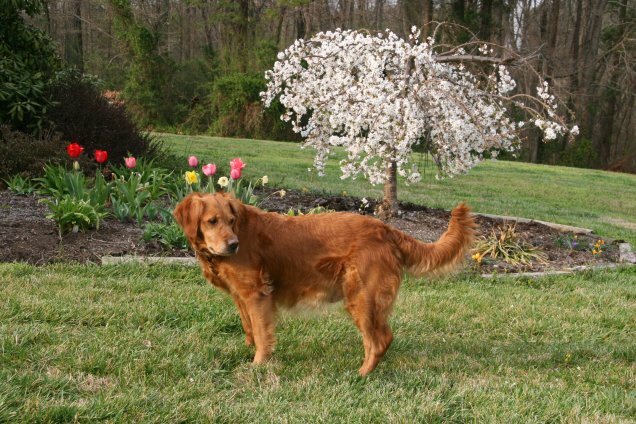 In summer 2006, Hilfy's dam Marcy was awarded the Outstanding Dam certificate from the Golden Retriever Club of America for the talents and accomplishments of her progeny. 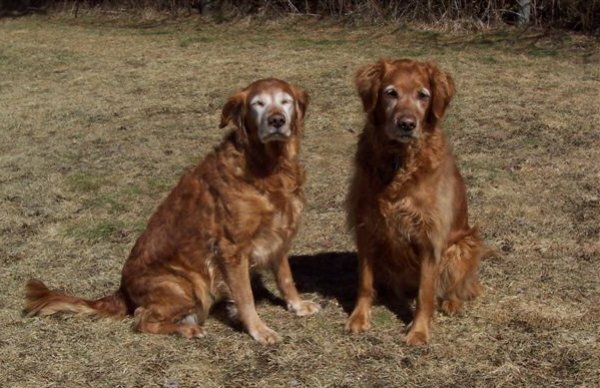 As Marcy's mother Tupper Tee (who lived to 16 and was still showing in veteran's obedience classes just a few months before she died) is also an OD, this makes her a second generation! Congratulations to her breeders/owners Adirondac Kennels on this very special accomplishment, and to the owners of all the special Hilfy siblings that earned this award for Marcy. 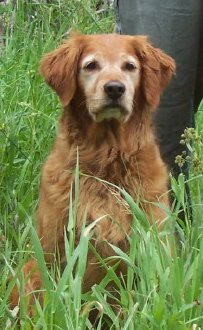 Hoya earned his Outstanding Sire title posthumously in 2010 -- well deserved, as he was a terrific sire of quality puppies. 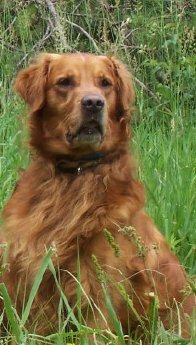 Longevity runs strong in this pedigree, and we Her grandparents died at 14.5 years, 2 at 15 years, and Tupper made it to 16. 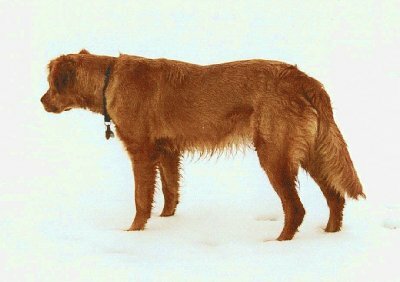 Her sire Hoya died of liver disease shortly before his 13th birthday, and Marcy lasted until a few months short of 14 as did Hilfy. 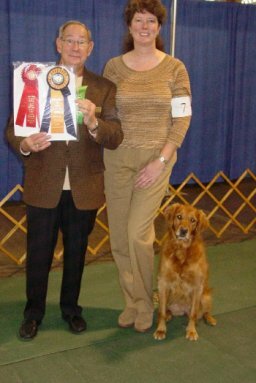 Here are pictures of Hilfy's full sister and littermate Adirondac Summer Time SH, CD, CGC, TDI, WCX, with her owner Diane when she earned her CD, and at left in Fall 2011 with a pheasant trophy. 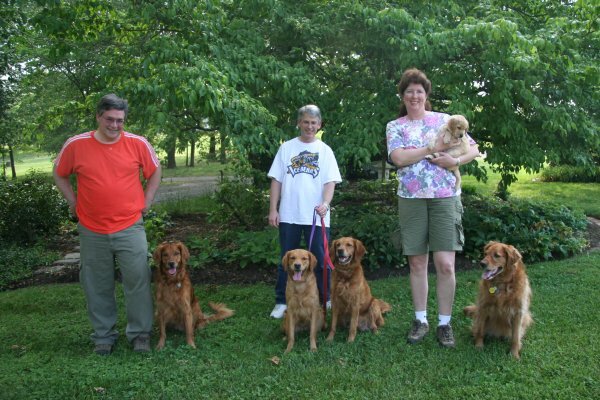 Hilfy's family -- left to right, Tom Sanfilippo with her half-brother Sundance; Jim with her daughter Penny and Hilfy; Diane Sanfilippo with her puppy Sedona and her full sister/littermate Summer.